Info "Chuck the fugitive animals back in their pen!" 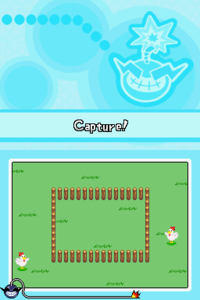 Farm Fresh is a microgame found in Ashley and Red's Total Drag stage of WarioWare: Touched! The objective of the game is to drag all of the animals into the fenced-in area. 1st level difficulty: There are two animals to capture. 2nd level difficulty: There are four animals to capture. 3rd level difficulty: There are five animals to capture. This page was last edited on September 9, 2018, at 20:51.